Cyclists in Las Vegas get ready for TOUR DE SUMMERLIN April 25, 2009. All abilities and experienced cyclists are invited to participate in the eight annual non-competitive bike ride through the Summerlin master plan community. This year the organizer, McGhie’s Ski Bike & Board, expect about 450 cyclists to the event. 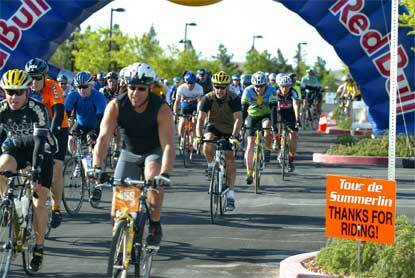 Tour de Summerlin, a very scenic ride, is sponsored by Summerlin and continues to grow in size. The route this year will include Red Rock Canyon National Conservation Area and through Summerlin real estate. There will even be post-ride events for bicyclists. Registration can be done through tourdesummerlin.com and registration for the bike ride will begin at 6 a.m. The ride starts and finishes at The Vistas community Park, 11311 Alta Drive. The bike ride includes 10, 35 and 80 mile rides. Registration before April 13 is $35 for the 10 mile bicycle ride and $50 for both 35 and 80 mile rides. Pre-registration can be done via telephone at 702-252-8077. Late registration will add $10 and can be completed on site beginning at 6 a.m. the day of the race. The extensive biking lanes and trail system within Summerlin connects many neighborhoods and is more than 150 miles in length. Residents rank the trail system and a very popular amenity to Summerlin. Summerlin’s existing trail system connects neighborhoods to dozens of amenities throughout the community and currently runs more than 150 miles in length. Cyclists in Las Vegas get ready for TOUR DE SUMMERLIN bicycle race on April 25, 2009.